T he events of Holy Week in San Miguel de Allende, Mexico, actually begin two weeks before Easter, and they start with a bang—literally. The first hint that something special is starting to happen comes with the sound of drums and hymns in the night from the direction of the village of Atotonilco, some eight miles from San Miguel. The beautiful Santuario de Atotonilco church is home to a much beloved statue, El Señor de la Columna, "Our Lord of the Column." Beginning at midnight in a procession of thousands of people, this life-sized figure of the beaten and bloody Christ is carried to San Miguel on the shoulders of the faithful. The statue is very old and molded from traditional Chichimeca materials—corn stalks, corn starch and powdered orchid bulbs. Christ leans against a column for support. He wears a loincloth and on his cheek is the kiss of Judas. For the procession, hundreds of silk scarves are brought by local women and lovingly draped across his battered body. Afterward, the scarves will be removed and safe-guarded for funerals and other religious ceremonies later in the year. Anyone willing to show respect is welcome to join the procession that marks the beginning of the events of Holy Week at any point along the route. As the group wends its way towards town, it stops now and then for prayers and hymns. Finally, it enters the northern edge of San Miguel, heading for the San Juan de Dios Church amid the deafening clang of church bells and, this being Mexico, the crash of fireworks. With the coming of Our Lord of the Column, the season of Semana Santa in San Miguel de Allende has begun! The next two weeks will see a long list of events of Holy Week. Insider's Tip: As dawn nears and the statue gets close to San Miguel, the best spots to watch are at the northern entrance to town (follow the crowd) or at San Juan de Dios Church, where a mass is celebrated at 8 am. This particular celebration began is 1812, when the people brought the statue from the church in hopes he would deliver the village from a raging epidemic. The tradition has been carried on every year since that time—just short of 200 years. For the next two weeks, El Señor de la Columna will be an important part many of the events of Holy Week, carried from church to church for various masses, then returned to San Juan de Dios until the season is over. Finally, three days after Easter, amid more fireworks and music, he'll be carried home to Atotonilco. 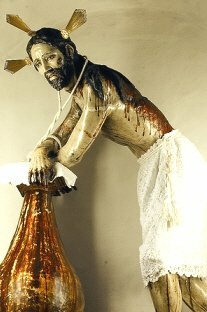 NOTE: For Semana Santa 2012, the procession of El Señor de la Columna falls on March 25.